The renovation process is an odd one. It’s pretty easy to get discouraged and worse, really bogged down with all of the small steps it takes to move forward. Thank God we enjoy Peterborough or this could get old really fast. The food offerings in this town are top-notch, there is no shortage of terrific indie restaurants to try out. Dale and I are making our way around the town picking a different spot each time we eat out. Whatever type of cuisine you crave you will find it fresh and well prepared for a fraction of the cost you find in Toronto. I took the Go Bus up on Friday night with Noodles on my mind so off we went for an amazing Thai Dinner at Cosmic Charlie’s. Okay don’t judge from the website which is pretty terrible ( barely functions at all) but you aren’t going to this place for web design, you are going for the food. That being said…. In the past service and wait times for food were a HUGE problem with this joint. Pleased to report that was not the case this time. The place was full of happy diners and our waitress was overflowing with Peterborough modesty; charmingly unpretentious, funny, great at making suggestions and quick with the beer order, a good start all in all! Cosmic Charlie’s serves Beau’s and Mill Street on tap, mmmmmmm craft beer! I ordered the Thai Red Curry Noodles(Chang Mai) with chicken while the mister got Jerk Chicken Wings with a mango salad. My dish was full of veg with not a green pepper in site, yay! The chicken was juicy and the noodles were perfectly cooked. The sauce was exactly what I was hoping for (spicy, complex and plentiful) and with the help of some chopsticks (that we had to ask for) I flicked it all over myself and across the table, in yer eye Mister! The Wings were crispy and breaded with a Panko-esk type coating. They were dry cooked with a Hosin style, Jerk seasoned sauce poured over top afterwards. Dale said the salad was a perfect match with the thin slivers of tangy mango cutting through the thick flavours of the wings. He did prefer the wings from Wild Wings across the street, but thought my noodles were amazing. Ummmm who orders wings at a Thai place? Ha! At least you can say there is something for everyone at Cosmic Charlies. The menu also has some Indonesian and Indian dishes, Seafood specials plus some random offerings like Fish and Chips. It’s really more of an Asian fusion restaurant then straight ahead Thai. There are three other Thai Restaurants in town that we will eventually make our way to, as per our pledge to try every restaurant, but this one will go on the short list of favs. 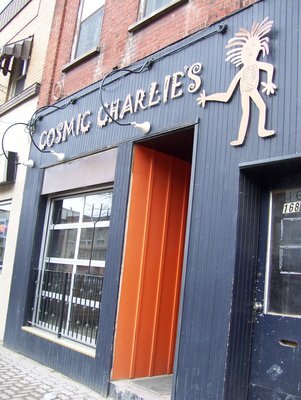 About a 10 min walk from the Rubidge House, Cosmic Charlie’s is right smack dab in downtown Peterborough @ 170 Charlotte Street. You might want to call ahead for a reservation as it’s a small space (705) 741-6491. Casual Dress is a-okay, thought some dress up to go here as well. Street parking only.